If you are on the lookout for a office laptop with a minimalist design, then check out the Dell Latitude 2-in-1 7390. The laptop sports a simple design with a black rubberised finish, and a silver Dell logo in the middle. However, don’t let the laptop’s subtle looks fool you. The device sports a 13-inch Full HD touchscreen display with narrow bezels. The screen is also protected by Corning Gorilla Glass. For security, the laptop comes with Windows Hello face recognition, and it also sports a fingerprint reader. Coming to the keyboard, the laptop features slightly elevated keys with a contoured design, which helps to make the keyboard comfortable to use for long durations. The keycaps are larger, which ensures that the laptop can maintain ISO compliance. Underneath is the trackpad, that offers palm rejection and multi-finger gestures. The hinge on the Dell Latitude 2-in-1 7390 lets you rotate the display by 360-degrees, which lets you use the laptop in tablet mode or tent mode. The device also comes with an Active Pen stylus, that can magnetically attach to the device. The Dell Latitude 2-in-1 7390 is available with up to an 8th Gen Intel Core i7 CPU, 16GB RAM and a 512GB SSD. In terms of ports, users get headphones-mic combo jack, microSD card slot, a SIM card slot, one USB 3.1 port and the Kensington lock on the right. The left of the device has two thunderbolt 3 ports, HDMI out, one USB 3.1 port, and a Smart Card reader. 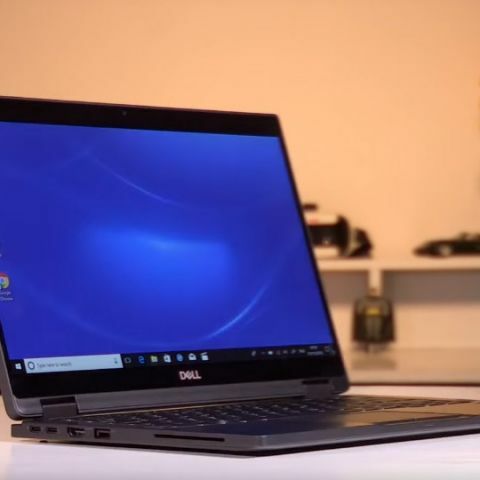 For more information on the Dell Latitude 2-in1 7390, check out the video below.